We’ve already posted some pretty pictures from the North Shore. But for anyone within striking distance–and that includes folks from Minnesota, Wisconsin, Manitoba, and Ontario–it’s worth remembering how easy it is to take a mini-vacation along Lake Superior’s northern shore in Minnesota. Our April visit was a last minute decision. We were at an impasse moving into a condo, stalled making travel plans, and not making much headway working. Getting away could only help, like a deep breath. We booked a room at an old stand-by, Solbakken Resort. It’s nothing fancy, but it’s where we honeymooned some decades back, and it’s conveniently located between Lutsen and Grand Marais. Solbakken’s attraction is that it sits right beside the water, where you can climb on the rocks, listen to the waves, and see the weather coming and going. The cozy cabins and motel rooms, however, could use new beds; I think my next visit will be after I’ve heard of this upgrade. Unlike in my childhood, the drive to Duluth and then up the North Shore goes quickly. From the Twin Cities, it’s about two and a quarter hours to Duluth, and then two more hours to Grand Marais. We drove up on Wednesday afternoon, arriving easily for check-in before dinner. With three nights, we found time to relax, sightsee, hike, do a little work, and eat pretty well. Day one started late (of course) with a drive up to Grand Marais in time for a late lunch at the Gun Flint Tavern. We took a liking to this place and returned late the next day, too. They serve their own brews and other distinctive local Minnesota beers; the owner’s dog, Reuben, is the house mascot; the menu is really nice (homemade soups and specials, sandwiches, ‘ethnic’ dishes, local and imported fish); and the staff is especially friendly. The tavern looks out across the street to the coved harbor of Grand Marais. We took our server’s recommendation and headed to Judge C. R. Magney State Park to check out Devil’s Kettle Falls on the Brule River. A late snowfall made the walk a bit treacherous. Snow was still several inches deep in the forest, and trails were icy and slushy. The river was running high and fast, a mix of cold gray and spring mud brown. Devil’s Kettle, a big pool at the base of the booming waterfall is mysterious in that no one has ever figured out where all that water goes. Dyes, ping pong balls and who-knows-what-all have been fed into the kettle and never observed surfacing again, neither down river nor out in Lake Superior. 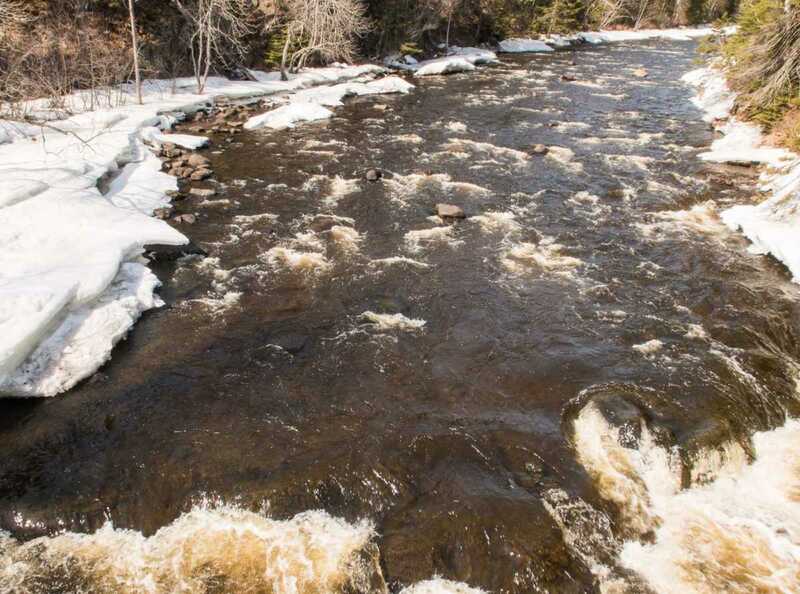 The fast Brule River fed by melting snow. Our second day took us on the scenic drive up the Gunflint Trail, the very same road I traveled as a kid to our annual family vacation on Gunflint Lake. (The road is now paved, and this trip, too, is faster. Four moose were hit by cars just this winter. Slow down and be aware.) This is the heart of the Boundary Waters Canoe Area where, in my mind, anyone who loves water and woods should visit at least once to canoe, camp, and live next to the clear cold water. Gunflint Lodge was our a lunch destination, and they came through with a tasty menu peppered with wild blueberries, a product of the local forests. Gunflint Lodge has been around for a long time, and they are one of the few places “up north” that remains open year round. Saturday was our day to head back to the Twin Cities, but we managed to take in two more State Parks and a fine lunch in Duluth. Tettegouche State Park is a great alternative to the more popular Gooseberry Falls State Park further south. Trails to Tettegouche’s falls (including the highest waterfall in the state) were closed due to April snow, or maybe we just decided not to attempt it. We hiked instead to Shovel Point. The trail traces along the rocky cliffs, with great views back to Palisade Head. Climbers had dropped off the cliff edge (by rope), and walkers stopped to sun themselves. Temperatures on Shovel Point in the brisk lake wind were significantly colder. Last stop before Duluth was the iconic Split Rock Lighthouse State Park. Besides learning about the history of the lighthouse itself (open to visitors) it’s fun to pull over and consider the history of the scenic drive along the North Shore. With our State Park pass, we also pulled into the campgrounds around the other side of Little Two Harbors, where we found a stony beach, the foundation of old fishing huts, and a serene view of the lighthouse from water’s edge. As we overheard one visitor tell a friend over the phone, “It’s like the ocean.” This part of Minnesota, called the Arrowhead (referring both to its shape and the carved stone arrow points made here by Native Americans) possesses a geology all its own. An ocean-like lake, semi-mountainous terrain, the Superior National Forest of pine, cedar, birch, and maple growing right out of rock outcroppings, and the network of lakes and rivers is a magnet for birds and wildlife. The big lake and its north shore deliver a dependable break from daily life and mundane scenery. It’s a corner of the world that renews the spirit. These pictures are so amazing. I really love spending time and reflecting around nature. This might just be a good spot. There are a number of highly regarded seminars for artists and writers up on the North Shore, too. Check out arts in Grand Marais and Split Rock. What a great getaway! 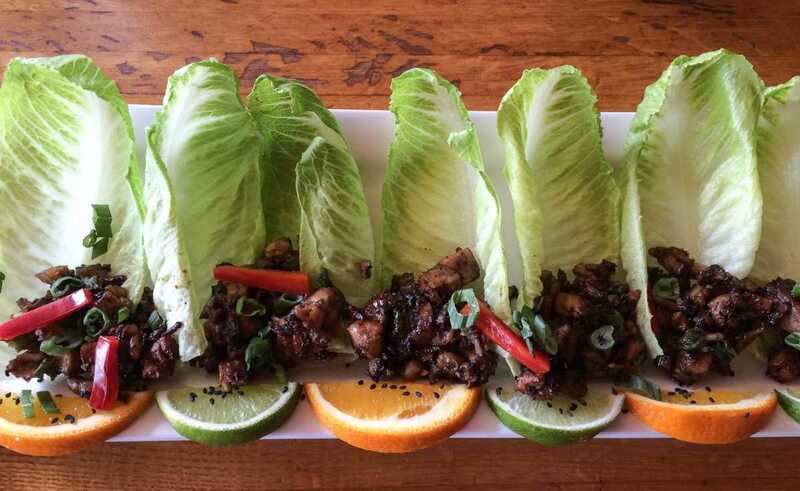 The Thai wrap at the Gun Flint Tavern look delish. We did something similar recently and took our son to some places that we vacationed when we were kids it is fun to retrace your step from childhood. Interesting little tidbit about the Devil’s Kettle you would think that someone would have figured it out where the water goes by now. That’s great! When we were at Gunflint Lake I had to walk over to the next property to see where we vacationed when I was a kid. The cabin is gone, but I’m pretty sure I walked across the exact site. The cabin was built on a massive rock that sloped gradually down into the water. Thanks for sharing! 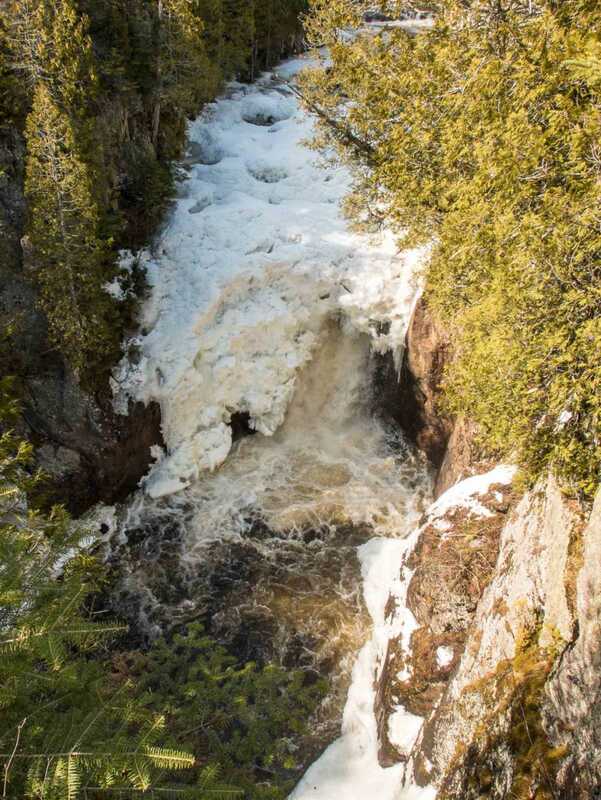 I love the photo of the Devil’s Kettle Falls, would love to head to Judge Magney State Park. Thanks, it was hard to shoot because the pool was in the shadows. But on the other hand, the icy snow give a lot of volume to the falls! Thanks! Of all the time I’ve spent in the area, this was my first time to Magney–and to Tettegouche–State Park. We’re now proudly displaying an annual MN State Park pass. 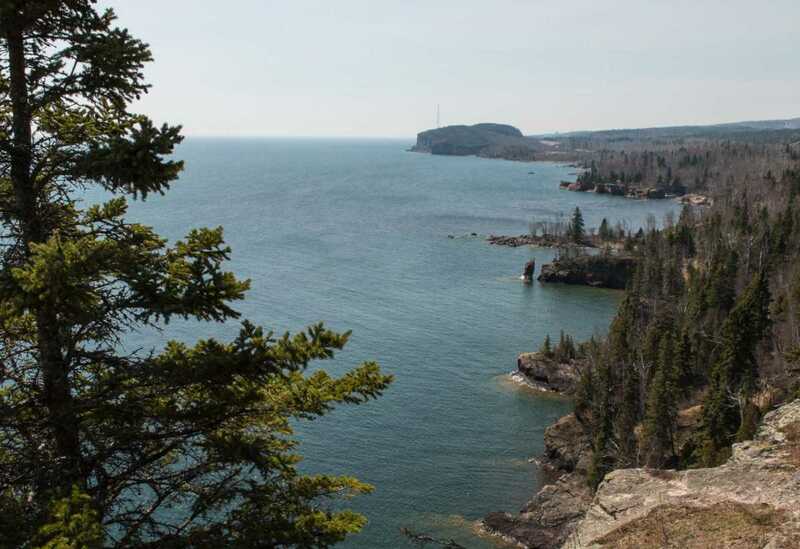 The views from your hike to shovel point look pristine. It certainly does look like the ocean! I think it’s a dilemma faced by many National and State parks where animals live. You want people to get out, enjoy and develop a sense of respect for the natural world. This seems true in the paving of the Gunflint Trail road. But, when animals are hit by speeding vehicles, it shows more education and awareness are needed when people venture into these areas to make sure they understand the dangers to themselves and the surrounding wildlife. 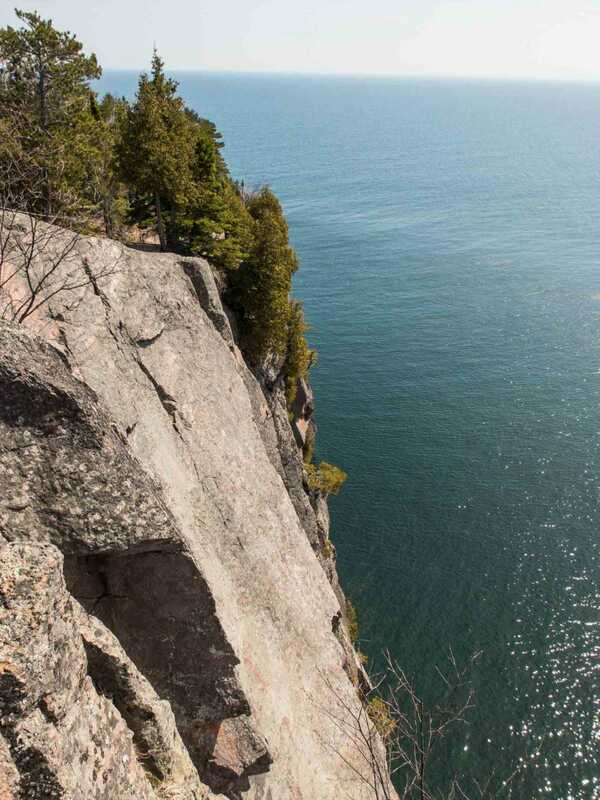 Thanks for sharing about the north shore of Lake Superior in Minnesota. I’ll keep it in mind for my next road trip. Moose sightings are common! Come visit. What an awesome view from Shovel Point! I actually have never heard of this Lake before but it looks like a nice place to explore. Btw that thai wrap looks so yummy! Great pick! I highly recommend starting with a visit to Duluth to see how the Great Lakes in general, and Lake Superior specifically, have brought shipping and commerce inland. Lumber and taconite (iron ore) were the big exports from this area. Absolutely stunning, bet you were praising the waiter that suggested this incredible nook of the world. Would love to know more about the menu, particularly the ‘ethnic’ dishes and local and imported fish. Massive foodie here, I mostly travel to eat. Lol! I’ve never been to the great lakes. The pictures look stunning. I’m going to have to make it up there soon. I’m embarrassed about how little of my own country I’ve explored. Hurray if I’ve encouraged you to drive north! I’m lucky the North Shore was our family vacation spot. It feels like home. I know lots of people who spend significant amounts of time on Lake Michigan, too. These lakes are inspiring! So pretty, it has been too long, need to go back for spring time and do a complete drive around the lake. The bike trails along the north shore are better than ever. I’m not so familiar with the south side, but I’d LOVE to bike around the whole lake, camping. Beautiful country up there, and a great idea to go up and visit around TBEX. Unfortunately it doesn’t look like we will make it this year. Even though we hadn’t planned to be in Minnesota these few months, we’re happy to be able to explore as if it were new! Next for us: Nebraska, Atlantic Canada, then China. See you around, somewhere, sometime. Sadly I won’t be going to TBEX which is too bad because your post shares some great spots in Minnesota. Lovely places to hike. Your first photo is beautiful and reminds me so much of northern Ontario. Hey! This is my old stomping ground! Well, kinda….. My in-laws live in Sault Ste Marie, Canada, and they have a cottage about an hour north of the city on Lake Superior. This really is an area of unspoiled natural beauty. The whole region appreciates your endorsement. Glad you’ve been able to get to know Lake Superior well. Thanks, Janice. We’ll just have to make a point of meeting up somewhere else. France perhaps? You said it, Betsy! We would have been all over Naniboujou had it been open. But it was really cool to explore the area in April, under bare branches and volatile skies. It will be fun to meet you here, Vicki. Will you have time to travel north from the Cities? Wow the place is so picturesque! I can’t imagine how surreal the landscapes of the trail must be! Is there a wide variety of affordable options for accommodation there? Where else to eat? It just seems like this place would be the perfect destination for a weekend trip. Real happy for you and you guys’ continuous love for love and life! Yes the accommodation options are very good, both on the North Shore and up the Gunflint Trail, as well as in the city of Duluth. Along the shore, Lutsen ski area offers tons of lodging open year round. Going up the Gunflint Trail, Bearskin Lodge and Gunflint Lodge are perhaps the best known, and do book up well in advance.